E.B White wrote the poem, “I Paint What I See.” He recreates the showdown between the great Mexican artist, Diego Rivera, and Nelson Rockefeller over political and philosophical differences related to a mural that Rivera has been commissioned to paint in Rockefeller Center. There are many links to video, audio, and print resources for studying E.B White’s poem. Also included is a link to a TED Talk ““How Painting Can Transform Communities” by Jeroen Koolhaas and Dre Urhahn. 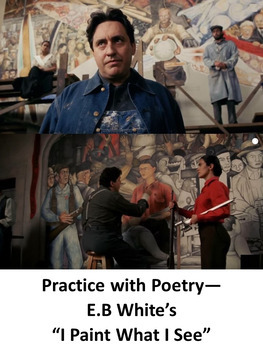 Students will examine clips from the 2002 film, “Frida” and will also read a New Yorker Magazine profile on Diego Rivera’s art in New York. 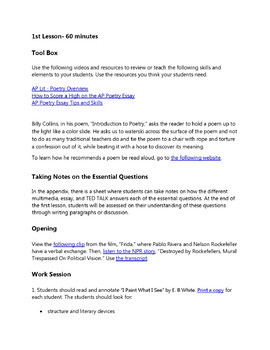 The lesson features an original prompt analyzing the poem. Students will craft a persuasive thesis sentence. Instructions and strategies are included on how to teach a SIFT analysis and hold an inner and outer Socratic Circle. The packet includes complete lessons, Common Core standards, essential and key questions. These lessons fit any Honors Literature class, Pre-AP, American Literature, World Literature or AP English Language or Literature class to prepare students for AP English Language exams, Common Core extended response assessments, American Literature Course exams, the SAT and ACT essay and critical thinking activities.